The following itinerary briefly outlines our one-day and overnight Introduction to Wilderness Skills Youth program. 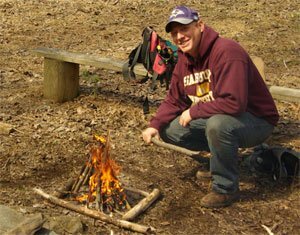 The focus of this course is basic wilderness training for campers, backpackers, and anyone who is out in the woods overnight. Objectives: Instruction in basic wilderness survival and technical skills. 9:00 am – meet at Butler School and discuss the wilderness preparedness – what is the minimum equipment that you should have with me in case of a survival situation? 12:30 pm – LUNCH – cook over fire if you like! GO-Adventures will provide equipment and guides for an Introduction to Wilderness Skills course. Overnight – $210 for up to 2 participants, plus $105 for each additional participant. 50% deposit due to reserve your program date, with balance due 1 week before the program. Let us know if you require an alternate payment agreement. Cancellation Policy: If making a cancellation more than 7 days prior to the program date, full refund is available. Cancellation within 7 days of the program date will forfeit your deposit or half of your program price. 5 days prior to your event, we will need the expected number of participants. If the number of participants changes within 3 days of the program date, no refund will be available. We require a 50% deposit to reserve your program date, and the final payment is due 1 week prior to the program. Should you require some other payment plan, please let me know prior to the program date. We require a 50% deposit to reserve your program. You may make your payment using cash, check, or credit card. If paying by credit card go to our website and click on the “Pay Now” button at the bottom of the page. You will be directed to a secure PayPal site where you can make your payment. Please note: In the description box please add your name, “Wilderness Skills”, and the date of your program. All group gear (and dinner and breakfast for the overnight program) will be provided by GO-Adventures. Participants are responsible for their own personal gear, and should bring the items on the list below. It is very important that participants have these items in order to ensure a safe and comfortable day for everyone! • Lunch that will not spoil – snacks are suggested! • ~50 feet of p-cord or other strong, narrow-gauge rope. P-cord (parachute cord) can be found in army/navy or outdoors stores. *Suggested Clothing: polypropylene or other non-cotton long underwear, wool socks, boots with good traction and ankle support, an insulating layer such as wool or fleece, a shell layer (water resistant), hat or bandanna. The woods can be very muddy, please wear clothing and footwear you don’t mind getting dirty. **Please note that, unless there is lightening, inclement weather will NOT discontinue activities-please come prepared! The waiver must be complete and unedited, both front and back, prior to participation. If you have any further questions or concerns, please feel free to contact our office at (301) 202-4106.